Dawn Ridyard and David Nightingale (centre left and right, first image), Headteachers at the two schools that have received the donated facilities from SIS Pitches, officially opened the two all-weather surfaces yesterday, which was cause for much celebration from the pupils. They were joined by George Mullan, CEO of SIS Pitches (centre right, back row), David McDermott, Chief Operating Officer at the Football Foundation (centre left, back row), John Shiels, Chief Executive at Manchester United Foundation (second from left, back row) as well as a number of SIS Pitches representatives. 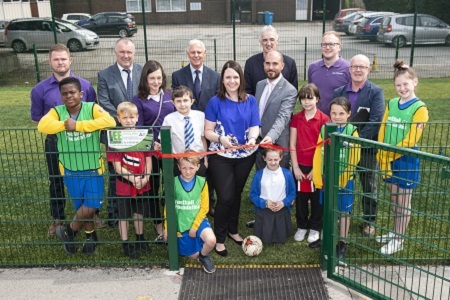 Schoolchildren and football fans in Greater Manchester will now benefit from a safe and enjoyable place to participate in grassroots football, following the opening of two new all-weather pitches for St Joseph the Worker RC Primary School and Moorfield Community Primary School yesterday (Thursday 17 May). 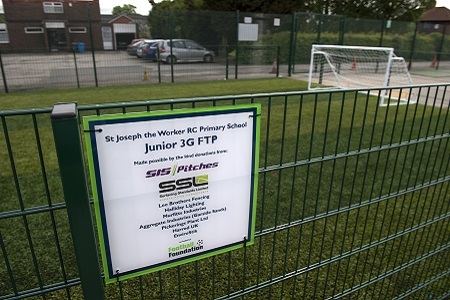 The 3G multi-purpose synthetic pitches have been donated by global specialists SIS Pitches. SIS Pitches has recently installed six of the 12 pitches for this year’s World Cup tournament in Russia; including at the Luzhniki Stadium in Moscow, the location of the World Cup final. This will be the first time a World Cup final is played on anything but an all-natural surface, with the pitch set to be the most technologically advanced in the tournament’s history. 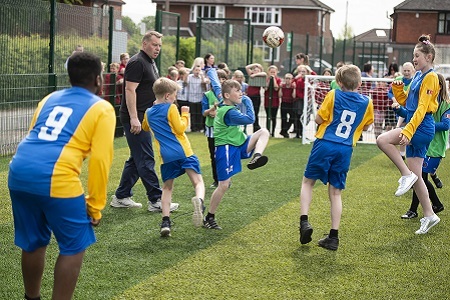 The organisation teamed up with the Football Foundation and Manchester United Foundation to develop the two SISTurf Superior playing surfaces for the schools in Irlam. They will be used by two primary schools as well as the local community, providing a fun and secure sporting environment in an otherwise underprivileged area. 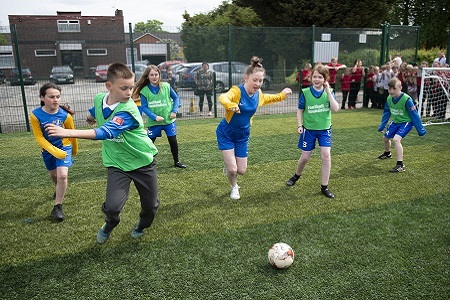 Manchester United Foundation has been involved in the project from its inception, originally identifying the primary schools as the site that would benefit the most from two new pitches. Additionally, Manchester United Foundation delivers Premier League Primary Stars sessions including Move With Manchester United, the objective of which is to improve children's agility, balance and coordination with the focus on pupils becoming confident and competent movers. Not only will the new football facilities benefit pupils during school hours, but they will also provide a venue for other grassroots community teams. Irlam Vale FC, a local grassroots football club are already set to use the new pitches for training – having previously used the schools’ grass pitches before the project. There is an aim for children at the primary schools to be signed to the team. The synthetic pitches were developed by SIS Pitches specifically for 5-a-side or cross-field football use. The surfaces incorporate the finest fibrillated yarn available in the industry, and can be used all-year-round including throughout winter weather. Each pitch took four days to install, with the works being completed in just eight days. 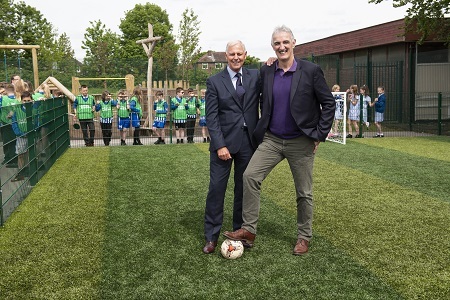 George Mullan, CEO & Founder of SIS Pitches Ltd, said: “We’re proud to partner with the Football Foundation and deliver this incredibly worthwhile donation - the installation and construction of two new pitches. They will make a tremendous difference; not just for the local primary schools but the surrounding community. John Shiels, Chief Executive of Manchester United Foundation, said: “For me, something like this facilitates all that is good about the beautiful game – and sometimes we forget that the beautiful games starts with young children, allowing them to express themselves in a safe and secure manner. That’s what this project will do, it epitomises it. 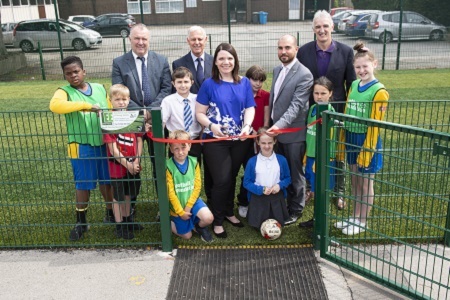 Barbara Keeley, MP for Worsley and Eccles South, said: “I am delighted to hear that St Joseph the Worker Primary and Moorfield Community Primary have had these all-weather pitches installed. I know they will make a real difference to the pupils at those schools and they could be a valuable asset to the wider community. 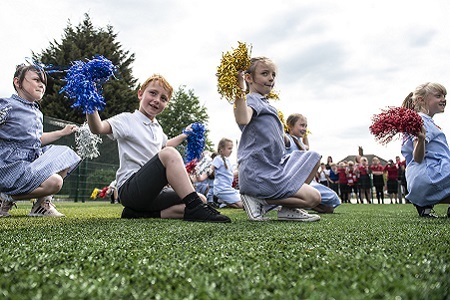 Dawn Ridyard, Headteacher at St Joseph the Worker Primary School, said: “Each day we have many very happy children playing on their new pitch! This whole process has been such a gift to us, I cannot thank those involved enough for their generosity, both in giving up their time and effort, and the kind donation.